For the longest time, KDP aggregated all sales information by week. Now KDP has nice graphical breakdowns of daily sales. Naturally, I wondered if my sales averages differed significantly by the day of the week. I compiled an Excel spreadsheet to give me a quick answer. Apparently the day of the week does not an impact for me, at least not in any significant way. 2) Go to KDP’s sales dashboard. Use one of the pull down menus to open the last 90 days of sales. This will give you the most days to average over. 3) Copy each day of sales from the graph to the spreadsheet. This will require some work because you have to do it manually and need to pay close attention to graph to make sure you are copying down the correct number. 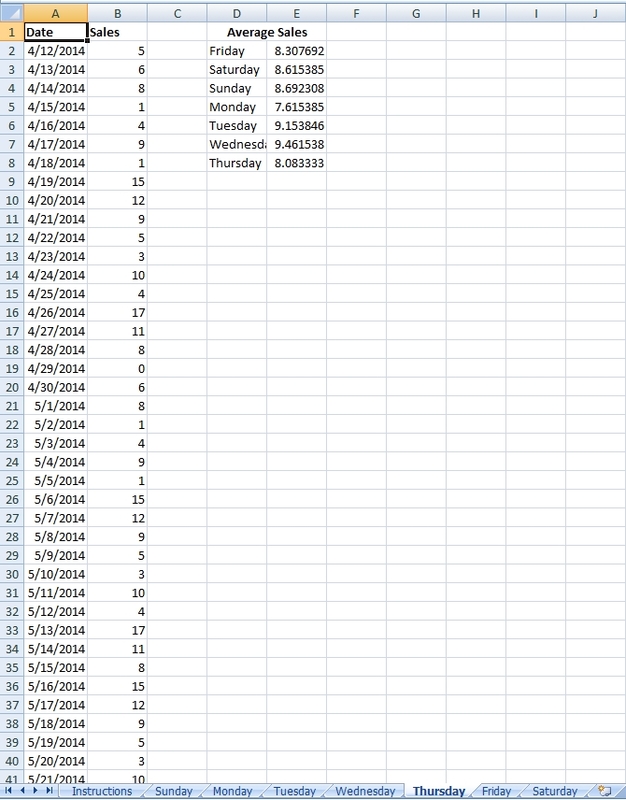 4) Excel will automatically calculate each day of the week’s average sales. Again, you can download it here. Let me know what you think. This entry was posted in Publishing and tagged Publishing. Bookmark the permalink.